Fear is one of the major reasons behind an elderly’s psychological stress. The individuals experience this fear because they worry about the damage that would come to their fragile body, there is a premorbid fear of death especially when the risk factors in the surgery are high. Lack of understanding and knowledge of the procedure can lead to over-thinking the outcome, creating more psychological vulnerabilities. They experience anxiety and stress because of lack of confidence and understanding of the pain. Some of them may become uncooperative during the operation. Feeling guilty of being a burden on the family for post-operative recovery. This is especially true when the primary caregiver is the elderly’s spouse. The elderly feels that he/she would become a liability on the family, creating more reasons for distress. In such instance they tend to suffer from insomnia, uneasiness, lack of appetite, fluctuations in blood pressure etc. before the surgery. Losing independence can also be one of the major reasons for not wanting to go into surgery. When the elderly are used to running things around the house it can be quite a challenge to think of being confined to a bed rest for a period of time. Cost of surgery can also be a reason for concern for many elderly. They may delay the procedures because of prohibitive costs or because the settlement of bills take too much time. If the elderly’s worries are not answered, and there is lack of pre-operative support, then the intra-operative stage could suffer critically. The elderly can go through hemodynamic changes, and in some cases serious physiological distresses like bleeding, which can disrupt the recovery. A critical intra-operative stage leads to a prolonged recovery, which means that there would be an increase in psychological distress post the operation, which may include, infection risk, immobilization of certain body parts, inability to communicate well, restlessness, indigestion, etc. Pre and post-operative support is very essential and should not be taken lightly, especially in places like India, where these type of support therapies are still overlooked. Typically the surgeon and his team of doctors should counsel the elderly to help understand the need for surgery, what to expect and the recovery time period. The elderly can also be made aware of the side effects, the medication regime, post-operative care guidelines and recovery period briefly. Setting realistic expectations is best to avoid post-surgery stress. The elderly must also be evaluated for psychological stress and counselling should be provided to relive any anxiety and emotional concerns. The counsellor along with the family caregiver should assure of the post-operative care responsibilities and also seek cooperation from the elderly. It is best to discuss the need/ necessity of a professional caregiver at this time so that the transition to post-operative care is smooth. This is especially important where the post-operative care is longer than 3-4 days. Help elderly understand how the cost of the surgery is being taken care of and what forms, claims they need to fill. Make them aware of the expected settlement time period for the bills. This will certainly help reduce anxiety. It is important for the family to identify a good psychologist or a therapist who understands and empathizes with the distresses of the elderly. He or she can be engaged to ensure that the elderly is recovering well emotionally. For elderly with long term recovery, it might be helpful to identify family members or professionals who could visit the elderly regularly and engage them in activities. The patient’s will and mental health play a very important role in the recovery. Look for signs of despair or depression and provide motivation and release to the patient. Ensure that the professional care giver is helping adequately with the personal care needs of the elderly and is well aware of the process of recovery, depending on the surgery. 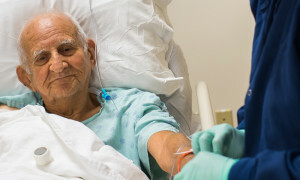 Helping the elderly settle his/her hospital bills through insurance, empaneled hospitals can be a huge relief and reduce a lot of anxiety for them. There are a lot of organizations which offer such services, where they provide psychological assistance as well as attendant services, with qualified and professional social workers and mental health representatives. This can help reduce the risk factors for delay in recovery and ensure overall well being of the elderly and the family. You can call us on 98184 00561 or write to us on contact@samvednacare.com. Studies show that elderly may be more prone to depression and loneliness, which can lead to higher rates of unhappiness. To address this issue, we have designed counselling and therapies for seniors with anxiety, low mood or depression, mild cognitive impairment/ memory difficulties, or dementia. Our trained in-home attendant service brings to you verified attendants and nurses, specially trained by specialists in elder care and dementia. Our staff is trained to not only take care of your elderly loved one’s physical wellbeing through top class personal care and nursing, but also their emotional wellbeing. The attendants are monitored by our Senior Care Specialists (psychologists and MSWs). Our service is available across Delhi, Gurgaon and Noida. We offer both male and female attendants as per request, for 12 and 24 hour shifts. Know more about our Trained Attendant Services here http://www.samvednacare.com/attendant-care-services.